Eye glasses are in the process of changing significantly. The eye glasses of tomorrow will be noticeably different than the variety of lenses and frames being offered today. Historians generally give credit to Italian monks for fabricating the first pair of eyeglasses at some point between the years 1285 – 1290. These spectacles, as they were commonly called, were used for reading. Eye glasses to correct distance vision are estimated to have been crafted in the early 1400’s. One of our Founding Fathers, Benjamin Franklin, invented bifocal lenses in the year 1784 which allowed for correction of both distance vision and near vision in the same lens. An Englishman, Sir George Airy, designed lenses to correct astigmatism in 1825. Trifocal lenses which have three specific powers (one for near vision, one for intermediate vision and one for distance vision) were produced by inventor and musician John Hawkins in the year 1826. In 1958, Essilor International introduced progressive multifocal lenses which further enhanced lenses with multiple powers for distance, intermediate and near vision. 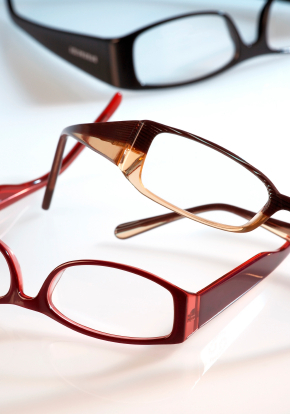 Technology is playing an increasing role in the evolution of eyeglasses. Lenses have been developed and continue to be refined whereby the entire lens adjusts with your vision needs. Electronic eye glasses have been designed with a special type of lens filled with a clear crystal liquid layer that can be electronically controlled automatically or manually. A touch of the finger to the side of the frames or a tilt of the head in a certain direction changes the entire lens to serve your vision needs. If you want to read something, a tilt of the head downward will cause the eyeglasses to automatically adjust the entire lens for near vision. A split-second swipe of the finger across the temples of your frames will allow you to look up from what you were reading and see a distant object clearly through the convenience and comfort of the entire lens. Electronic glasses are powered by a battery and need to be re-charged. They are currently offered to the public but as you may guess with any emerging technology, they are rather pricey today. While not targeted towards vision correction, electronic display eyeglasses are being developed that use eye movements to control presentation of information. These eyeglasses contain a microchip that takes data from a PDA (Personal Digital Assistant) and displays it directly on the person’s retina, creating an illusion that the images and text are a few feet away. Eye movements can control menus, search information, play video and conduct many other tasks routinely performed on desktops, laptops and mobile devices today. This advancement in eye wear is still in the prototype phase. The technology is not yet at a point where its purchase and every day use are feasible. Discuss emerging eye wear technologies that may serve your unique vision needs, lifestyle and budget with your eye doctor at your next eye exam. The options and the choices are changing.